References in here refer to Washington State, but this applies to any place with an algae bloom. Blue-green algae are actually bacteria that have qualities similar to algae and other plants. These bacteria are cyanobacteria – cyan means “blue-green” – and are commonly found on land and in lakes, rivers, ponds, and in estuaries and marine water. What is a blue-green algae bloom? 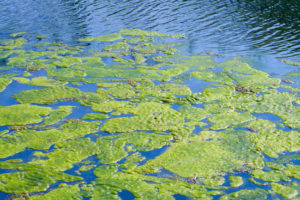 A combination of warm temperatures, sunlight, and nutrient-rich waters can cause blue-green algae to reproduce rapidly, or “bloom.” Within a few days a clear lake, pond, or ditch can become cloudy with algae growth. Blue-green blooms usually float to the surface and can be several inches thick near the shoreline. Often looks like green paint floating on the water, but can also look bluish, brownish, or reddish green. Is made up of extremely small organisms that are hard to pick up or hold. Is most common in the summer and fall but can occur anytime. What is a toxic bloom? Some blue-green algae produce toxins or poisons. In their toxic form, blue-green algae can cause illness in humans, pets, waterfowl, and other animals that come in contact with the algae. Toxic blooms can kill livestock and pets that drink the water. Dead fish, waterfowl, or other animals. Sudden, unexplained sickness or death of a cat or dog, especially if it has algae on its mouth, legs, or feet. Skin rashes on humans after being in the water. Eventually the toxins break down in the water and are destroyed naturally. How do the toxins affect animals and humans? Blue-green algae can produce both nerve toxins (neurotoxins) and liver toxins (hepatotoxins). Call your doctor or veterinarian right away if you or your pets or livestock have signs of poisoning. Residential drinking water is sometimes taken from a lake. If this is the case and a bloom occurs, do not drink the water until laboratory testing shows the water is safe. In people signs may include numbness of the lips, tingling in fingers and toes, and dizziness. In animals signs include weakness, staggering, difficulty breathing, convulsions, and death. Signs appear within 15–20 minutes after ingestion. Signs include abdominal pain, diarrhea, and vomiting in humans and death in animals. It may be hours or days before signs of liver poisoning appear. What if I see a bloom? Avoid all contact with water containing algae. Keep pets and livestock away from the water. Contact the environmental health section of your local health department or the Washington State Department of Ecology. Learn how to report and test and algae bloom. Laboratory tests of water samples can confirm whether or not a bloom is toxic. Contact your local environmental agency about having water tested. What happens if a test is positive for toxins? If a test shows that a bloom is toxic, county health officials will decide whether to close the lake for recreation, post notifications of potential health concerns, or wait for further testing. Can testing ensure that all areas of a lake are safe? No. Blue-green algae blooms are known to be very patchy in nature. Higher densities may be present in areas not surveyed, particularly along shorelines. Recreational users should avoid contact with water whenever surface concentrations of algae are evident or when the lake has an obvious green to blue-green appearance. How is it determined when the water becomes safe once a bloom is reported? Washington State Department of Health recommends testing the water once a week after toxin levels are above a certain concentration. Recreational use should be avoided until levels drop below recommended guidelines. Local health officials will decide when to re-open the area. Can I eat fish from cyanobacteria contaminated water? Toxins can accumulate in fish tissues, especially in the liver, kidneys and other organs. Exercise caution when considering eating fish caught in areas where major cyanobacteria blooms occur. Before eating, remove internal organs, which may contain more of the toxin. Learn how to identify and report blooms. Caution others to avoid water when blooms occur, and keep pets and livestock away. Report algae blooms to your local health department or the Washington State Department of Ecology. Limit use of fertilizers. These contain nitrogen and phosphorus that find their way to lakes and streams and contribute to blooms. Phosphorus is known to contribute to algae growth. A new law in Washington, RCW 15.54.500, discourages homeowners from using fertilizers with phosphorus on healthy lawns. Brucellosis diagnosed in a dog, from raw meat origin.